With a drop in local property prices luring growing numbers of second-home buyers to Normandy, Carla Passino explores the peaceful countryside and dramatic coastline that inspired many 19th-century artists. A turbid river flows languidly across the Normandy countryside, past ancient thatched cottages, apple-laden trees and small herds of cows placidly surveying the view. On the banks, thick with ducks, the air is rich with the scents of freshly churned butter, fermenting cider and the first hints of salt—even though the sea is only a mirage in the distance. but, follow the Orne or the Seine to the coast, and you’ll discover a different, almost wilder landscape. Whimsical outcrops and sheer chalk cliffs rise from the ocean on the Alabaster Coast, tall, swaying grasses fringe the ochre expanses of the D-day Landing beaches, foaming waves batter the Goury lighthouse off Auderville and, in Mont-Saint- Michel, the world’s prettiest monastery stands as a testament to Man’s triumph over Nature. Shaped by dramatic contrasts—savage sea and tame countryside, fashionable coastal resorts and rustic inland villages, a blood- soaked history and the peaceful unfolding of everyday life—Normandy’s beauty is so enthralling that, over the centuries, it has nurtured the imagination of countless artists. Impressionism, in particular, found its roots here: Claude Monet had spent his early years at Le Havre and his painting of the sun rising above the harbour, titled Impression: Soleil Levant, gave the movement its name. Monet had an especially deep link with Normandy. He visited it repeatedly and first rented, then bought a house in Giverny, where he lived until his death in 1926. In a way, he was the precursor of the many people who, having fallen for the region’s charms, can’t resist the urge to live there, if only during the brief respite of the holidays. 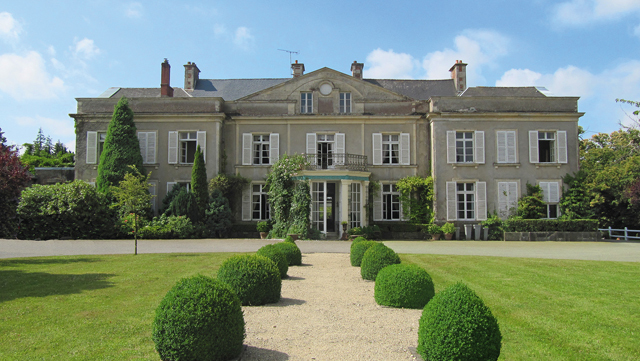 The perfect place to enjoy Normandy’s country lifestyle, this elegant Calvados château comes with some 74 acres of parkland, woodland and meadows coursed by a river. Leggett Immobilier (0870 011 5151; www.frenchestateagents.com) and Philip Hawkes (00 33 1 42 68 11 11; www.PhilipHawkes.com). Today, says Joanna Leggett of Leggett Immobilier, second-home buyers hail from many countries: France, of course, but also Belgium, the Netherlands and Britain—thanks to local airports offering seasonal flights into London City, Stansted, Southend, Leeds and East Midlands, and to the many ferries linking Caen and Le Havre to Portsmouth. Like the Impressionist painters and the beau monde of the late 19th century, many of these incomers flock to the resorts of the Côte Fleurie. ‘the coast of Normandy has always been a pull, especially for Parisians,’ says Patricia Hawkes of Philip Hawkes Conseil Immobilier. the main destination in the area is Deauville, which became the resort of choice for the upper classes in the Belle Époque, after Charles, duke of Morny, illegitimate half-brother of Napoleon III, turned the sleepy village into an exclusive summer playground complete with buzzing racecourse and luxurious villas in the timbered Anglo-Norman style. A hundred years later, Deauville remains desirable and sophisticated. Life still revolves around the casino, horse racing, Thoroughbred sales and the beautiful beaches that so fascinated 19th-century artists— both Monet’s mentor, Eugène Boudin, and Edouard Manet painted beautiful vignettes of elegant ladies relaxing on the shore— with the newer additions of polo, film festivals, golf and great restaurants spicing up the offering. Mrs Hawkes particularly extols the virtues of the amazing French seafood served at the historic Normandy Barrière Hotel and the Casino Barrière.  Food is also high on the agenda at nearby Honfleur, which is home to SaQuaNa, a pared-down restaurant in which chef Alexandre Bourdas combines French tradition with Japanese influences in an innovative cuisine that has earned him two Michelin stars. Many good brasseries—notably Le Bréard and La Tortue—dot the town’s pretty streets and more Michelin-star food is served at the Relais & Chateau hotel Ferme de Saint Siméon, where Honfleur’s gastronomic bounty—shaped here by the hand of chef Mickael Lelièvre—meets its artistic heritage. Once a simple inn, the Ferme was one of Boudin’s favourite retreats and the young Monet spent much time there when visiting Honfleur. both the inn and the town were hugely popular among painters, who were captivated by the play of light on the Seine estuary, and Honfleur’s bay, harbour and heavily timbered buildings grace the works of Camille Corot, Johan Jongkind and Gustave Courbet, as well as, of course, Boudin and Monet (the Musée Eugène Boudin, which reopens in April 2015, has a good collection). One of Monet’s favourite haunts, the little Caux village of Varengeville-sur-Mer, also stirred the genius of Sir Edwin Lutyens, who built a magnificent Arts-and-Crafts house for Guillaume Mallet. Still owned by Mallet’s descendants, who open the grounds to the public between mid March and mid November, Le Bois des Moutiers looks rather more English than Norman, as do the glori- ous, rhododendron-studded gardens, which were designed by Gertrude Jekyll. 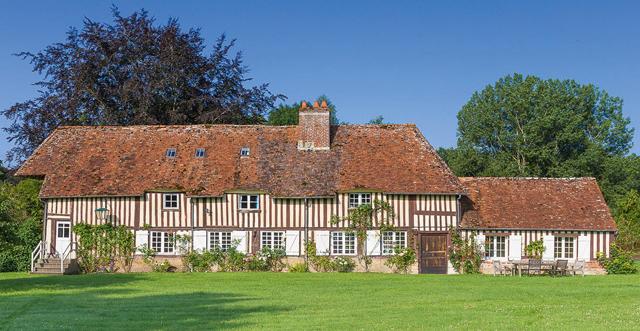 Dating from the 18th century, this distin- guished manoir stands in about 12 acres of landscaped grounds close to Deauville. 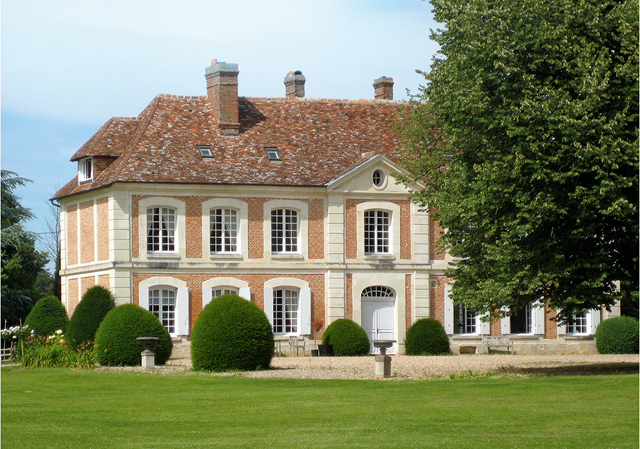 Leggett Immobilier (0870 011 5151; www.frenchestate agents.com). West of Deauville, past Caen, lies another area that has close ties with England—this time of a historic nature. Situated just south of the Landing beaches, the Bessin stretches around Bayeux, the first town to be liberated in the Battle of Normandy, where a museum commemorates the Landings and another houses the original of the 11th-century tapestry depicting William the Conqueror’s victory over Harold in 1066. Among the enduring hotspots here, Emma Nicholson of Leggett Immobilier mentions Balleroy, with its 17th-century château and hot-air balloon museum, and Port-en- Bessin, the pretty, luminous fishing village close to Omaha Beach that was masterfully painted by Pointillist artists Paul Signac and Georges Seurat. However, buyers looking for Normandy at its most rural often head east and south of the Bessin into the Pays d’Auge and the Pays d’Andaine. Set just south of the Côte Fleurie, the bucolic Pays d’Auge, where ‘the countryside is delightfully green and peppered with hedged fields and old woodland,’ according to Mrs Hawkes, encapsulates the Normandy dream. The landscape is dotted with grand châteaux, delightful maisons à colombage—France’s answer to Tudor cottages—and 18th-century presbytères, the French equivalent of a rectory. 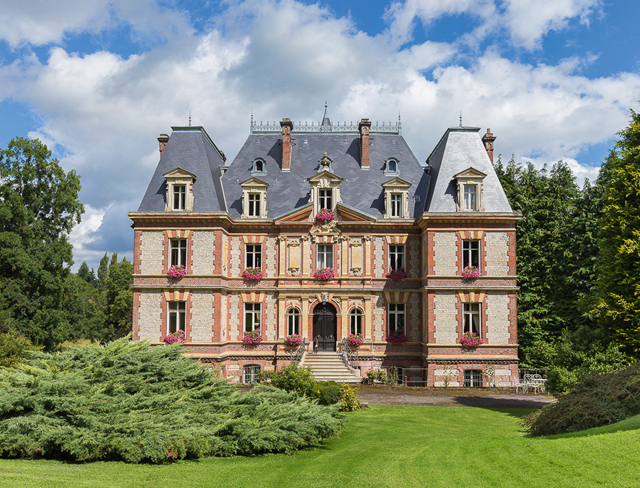 Situated in the lush Pays d’Auge, this majestic 19th-century château comes complete with a chapel, a pigeonnier and about 51 acres of woodland, ponds and grounds. Chestertons (020 3040 8210; www.chestertons.com). Further south, in the wooded Pays d’Andaine, the place to be is the historic spa town of Bagnoles de l’Orne, in the Andaine Forest, according to Mrs Nicholson. One of the pioneers of this area was Edgar Degas, who, in the 1860s, explored the Bagnoles countryside from his base at the Château de Ménil-Hubert-en Exmes, and, despite not being much of a landscape artist, felt the urge to paint the local, jagged rocks. But the town’s golden age was the Belle Époque. An entire quartier of elegant summer retreats, still miraculously intact, was built at the time, and well-heeled residents encompassed both European and literary royalty, including Alexandre Dumas. Today, says Mrs Nicholson, Bagnoles remains attractive to second-home buyers for its packed calendar of activities, ranging from golf and tennis to swimming and riding, and excellent restaurants—especially the Michelin-starred Le Manoir du Lys, where chef Franck Quinton creates innovative dishes from local ingredients, such as Camembert, Isigny butter and the Andaine mushrooms. Normandy’s staggering diversity of landscape is mirrored by an equally wide range of property prices. According to Mrs Leggett, you can pay as little as €17,000 for projects requiring full renovation to several millions for sumptuous châteaux. And in the centre of Deauville, notes Mrs Hawkes, ‘a newly constructed, top-quality apartment can easily match a Paris flat in value’.